Khan said there were bleak or no chances for peace and that the US strike had almost destroyed the prospects for that. “Did they only have to kill Mehsud when there was a chance of peace? Does this mean the US will not allow peace in Pakistan?” he argued, stating that the nation stood at a “defining moment for Pakistan”, and despite that chances of peace looked bleak. He, however, said joint efforts could still yield results. Khan made it clear that he well understood the situation and had no “intention” of going to war with the US. However, he argued that a united nation could convince the Americans to respect the sovereignty of his country. The PTI chief called for unity among the political leadership of the country to face the challenge to its sovereignty. “We will have to stand united and tell the US that you have destroyed a chance for peace in Pakistan, and we take a united stand on this … We have been condemning (drone) strikes for nine years. Mere condemnation will not change anything. 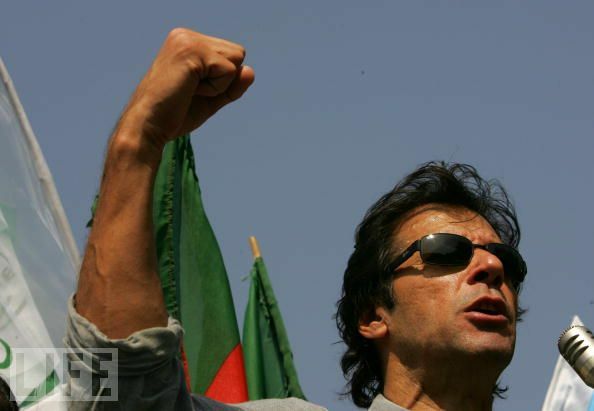 We will have to send a strong message,” Khan said. The PTI chief, once known for his arrogance, even went to the extent to offer his services to unite the political leadership and said he was ready to go and meet everyone to bring the nation on one page for peace by putting all differences aside. Khan added that visiting the US each time and begging for dollars would never help Pakistan get rid of the “slave mindset”, as masters never took slaves seriously. “Beggars don’t become a nation, only unity can make us a nation,” he asserted, adding that if it did not work, Pakistan should use its options of stopping the NATO supply line and going to the United Nations Security Council against drone strikes. Imran looked impressed with the efforts made by Interior Minister Nisar Ali Khan for the success of the peace process. “All efforts were made by Nisar and we got to the point of talks, but then that peace jirga was struck. So I ask, is US our friend or enemy?” Khan said. Earlier, Nisar updated the House on the government’s efforts to hold peace talks with the Taliban and hurdles being created in doing so. He again termed the US drone attack, that killed the TTP leader on Friday, “a conspiracy to derail peace process”. The minister, however, vowed to continue with efforts for holding peace talks with the Taliban. “This would only be possible after the militant outfit chooses a new chief,” he added. Lamenting that a larger conspiracy was aimed at disrupting talks with the Taliban, Nisar said prospects of dialogue with the militants was “unfortunately” no longer possible. He said the team formed to initiate the dialogue was meant to set off to meet the TTP a day prior the drone strike. Nisar commended all political parties for uniting to pursue peace talks and exhibiting patience despite the ongoing attacks. He said evidence had been gathered for the Qissa Khawani attack, the Peshawar church attack and the killing of Major General Sanaullah Niazi, adding that the timing of these acts of terrorism was suspicious. He also thanked the army for going an “extra mile” to protect the peace dialogue, despite the grave security situation that was developing. Non sense statment by IK. I hope that the US will follow this agreement. poor people, SHAUKATH KHANUM in the country. Also constructing and managing a world class university, recognized by Braford university. Also the blue tongue lizard does not get involved in money laundry activities like your favorite Nawaz Sharif. I agree with you, he has failed to impress Nuts like you. Do yourself a favor, in the next election vote for him. Only some one who does not know whom to send Fathers Day Card can send such comment. Anon you need something that would change your coming generation. LOL! How about imran taliban khan and his pti burgers won't be allowed in usa, uk and canada from the 20th november. @USA is the best Yes you need LOL. Why was the NA Hall so thinly populated and where was the Prime Minister? What was Ishaq Dar doing there? The people who voted for this PMLN assembly members should drop dead with shame. The biggest worry for the party of baldies would be that Imran Khan stole the show. God works in mysterious ways. There's always Hope. InshaAllah. Ameen suma ameen. Imran Khan is "Nemesis of Pakistan"
USA and European countries – must put ban on IK and PTI supporters to enter in their countries – they should not be allowed to travel to USA / UK nor they should be allowed to get any party support funds from these countries. Period. IK is the biggest enemy of Pakistan Army. What a bi.ch.You must be a jilted lover of Khan ( IK) You will find someone in USA or Europe if you have not found already. IK is so narrow & stupid minded that he has forgot that just before elections he went to USA for raising money/funds for his election campaign. IK is not a leader bust just an ordaniry Hipocrate. Not bad for being a astupid, he was able to win world championship in cricket for his country, build and successfully manage the only cancer treating hospital for poor people, – SHAUKATH KHANUM HOSPITAL and constructed and manages world class University for pooe students recognized by Bradfor university, England. Also he DOES NOT GET INVOLVED IN MONEY LAUNDRYING ACTIVITIES LIKE NAWAZ SHARIF AND HIS BELOVED BROTHER. DO YOURSELF A FAVOR IN THE NEXT ELECTIONS VOTE FOR IMRAN KHAN AND HIS PARTY PTI. @sahmed – for how long you PTI supporter will quote these lines – come out of this confusion and wake-up – you ppl are trapped in a hole and IK is the one who have brought you at this stage. Had he been a good leader he could have shown some flexibility in his political behaviour – He was Negative , is Negative and will remain a Negative character. Sahiba is right – he is an absolute Hipocrate. ARE YOU GUYS INTERESTED IN NATION BUILDING OR JUST BLAME GAME…WAKE UP AND SMELL THE COFFEE AT THE MACRO-LEVEL. SEE THE FOREST DO NOT CONCENTRATE ON THE TREE. PAKISTAN ZINDABAD…..